APPLICATIONS FOR THE 2019-2020 ACADEMIC YEAR ARE AVAILABLE NOW. Start preparing for the application process now. Please also check out the AFAS Merit Scholarship and other Education Support options offered by AFAS for Air Force dependents. 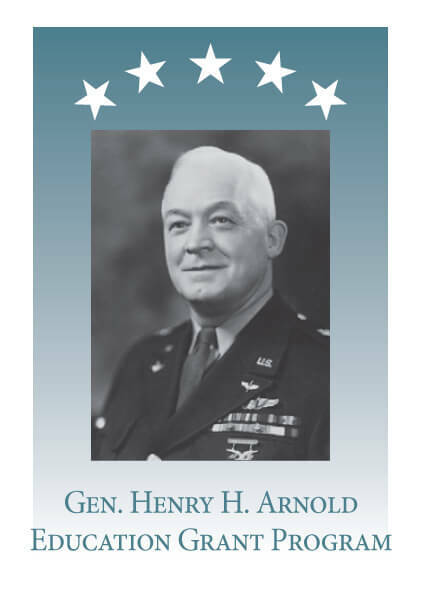 The General Henry H. Arnold Education Grant program,also known as the Hap Arnold Grant, is the centerpiece of AFAS education support. The application process for the Arnold Education Grant serves as the platform for other key education support opportunities at the Society. The Hap Arnold Grant is competitive in its needs-based selection criteria and is uniquely tailored to recognize the proper weighing of family income and education costs. Grants ranging from $500 to $4,000 are awarded to eligible Air Force dependents each year. The specific amount awarded correlates to a student’s particular level of financial need. A unique feature to this program – each grant awarded carries the name of an individual or organization exemplifying service to the USAF, and that biographical information is sent to each grant recipient. See a full listing of named Arnold Education Grants. AFAS education support is available to dependent sons and daughters of active duty, Title 10 Reservists on extended active duty, Title 32 Guard performing full-time active duty, retired, retired Reserve and deceased Air Force members, as well as spouses of active duty and Title 10 Reservists, and widows/widowers. Before you get started, review the key steps for completing the Hap Arnold Grant application here. Applications are now available for the 2019-2020 school year. Detailed instructions explaining how to register for an AFAS Education Grant account and how to complete the online application can be found here. Keep these key dates in mind while working on your Arnold Education Grant application. View the 2019-2020 timeline here. The most commonly asked questions about the Arnold Education Grant application process are addressed here.